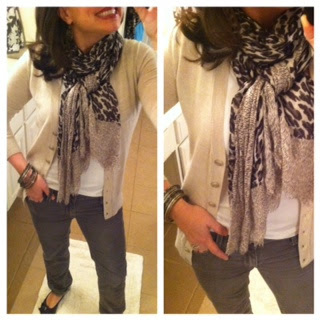 Leopard With Camel and Grey..and some CLOSET ORGANIZATION tips! You guys are getting two for the price of 1 today! 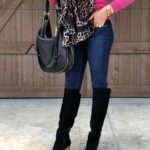 An outfit re-creation like you do everyday AND closet organization tips. and I just thought “blah”. I pulled out my phone to look at the picture again, and I realized I had one of the pieces wrong. I had on a black cardigan instead of the light khaki colored cardigan. 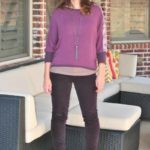 I changed cardigans, it lightened the whole outfit up, and it made all the difference! I found a couple pairs of black flats similar to mine….and I also have some leopard flat options. If I’ve told you once, I told you a thousand time, you NEED a pair of leopard flats. 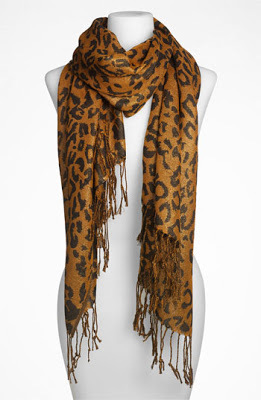 And…HERE is a similar scarf from Nordstrom in either black/bronze (shown) or a silvery grey. 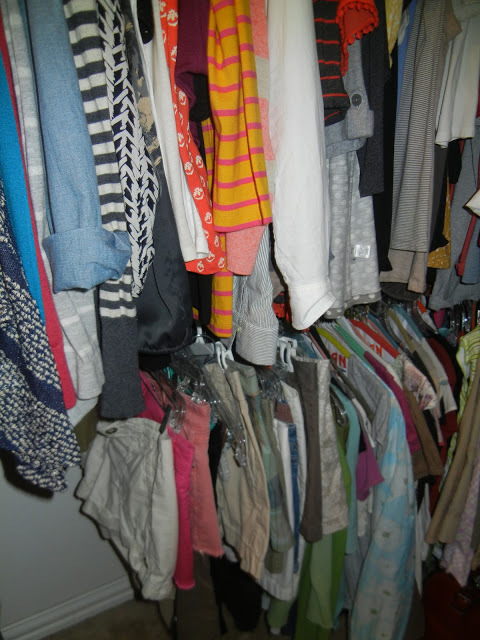 Now…on to the organization tips! 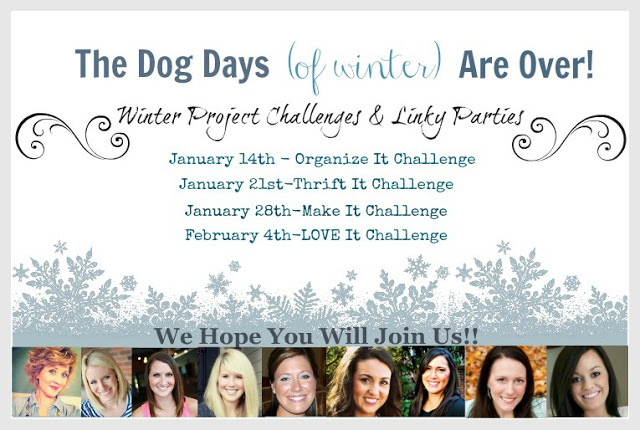 This week is the Organize It Challenge! I get lots of questions about how I organize my closet, and this linky party was just the motivation I needed to show you! And let’s just get this out of the way…. I know that lots of people are linking up awesome DIY projects that will probably blow your mind, but this is all I got. I don’t really make anything, but I’m sooo good at buying stuff. And I’m extra good at buying stuff at The Container Store. If I can buy something that is going to make my life easier (and it’s not gonna break the bank), I’m totally gonna buy it. Here’s my closet in all it’s glory. THIS amazing little gadget is only $5.99 from The Container Store. You wouldn’t believe how may scarves it holds. THIS canvas shelf for shoes. I stack flats, flip flops, and wedge sandals in this puppy. I love it. It would also be great for t-shirts or sweaters. It gives me a double row to hang things. I have three of THESE in my closet. 2 on my side, and one on the hubby’s side. THESE huggable hangers you see on the right. Are they more expensive than your average hanger? Yes. Are they worth it? Absofreakinlutely. They are a HUGE space-saver, NOTHING slips off of them, and they just plain look nice. Is it totally weird that this picture makes me incredibly happy? Cause it does. Big time. 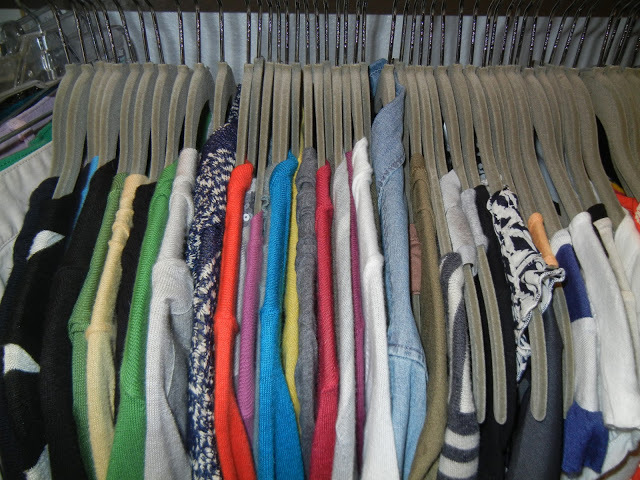 And I just counted, and you can see 21 cardigans in this picture. This also makes me happy. Most things in the collage are pieces that I actually own, but I also included a couple of pictures of entire closet systems. Why? Because a girl can dream. I mean….this stuff will keep you and your closet in line! Thanks for stopping by today ladies! 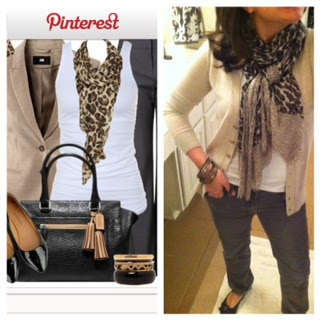 I hope you come back to see some more of my Pinterest inspired outfit creations! And check back later this week for my next installation of A Bachelorette Told Me To! For those of you visiting from the link-up, one of my besties is Sean Lowe’s sister! So, one time per week until the end of the season I’m going to give Pinterest a break and I’m going to re-create one of the outfits that one of the bachelorettes wears on Monday night. To see the first post where I recreated one of the girl’s headshots, click HERE. First, you know how I love any post about organizing! I don't have a scarf organizer (shame on me!) but I'm buying one tomorrow thanks to you! Second, you only showed 21 cardis…what about the other 60 you have in there…you know I'm right. They need to see a picture of THAT! Brave, brave girl, showing your closet. Then again, it looks great, that's why! I finally organized my scarves last week and what a difference it made. That do-hickey from Container Store is incredible! Oh and I'm working on a fashion DIY from Pinterest just for your link up on the February 1st. Can't wait to see how this turns out. I love all things organization. I really want one of those scarf organizers now. All of mine are stuffed into a bin and you better believe I forget about the ones at the bottom. I think I need to take a trip to the container store! I will be buying that scarf organizer this week! Mine are all in a nasket in the coat closet and it's such a pain to grab the one want when I'm in a hurry. This will just plain save me! A friend told me I should get the fuzzy hangers (that's what I like to call them) but I'm on the fence. Mainly, I HATE shoulder marks in my sweaters/heavier shirts. Do you find you get the shoulder marks? Otherwise what hangers do you use for those, or do you fold them? I love how you tie your scarves! Can you give us a little tutorial? Later this week (Thursday I think) I have a scarf tutorial that you will LOVE! Buying that scarf organizer ASAP!!!!!!!!! I just have mine on hangers, such a mess. Thanks for sharing about it. And only $5.99?!?!? Score. And, I'm with Shay…..where are you hiding the rest of your cardigans?!?!? Ha! Okay first I need a scarf organizer, second I need to have more than 2 scarves in my possession, seriously, I only own 2, but I might just start buying everything I see so I can get one of those organizers! Those hangers are the Bom! I wouldn't be able to fit nearly as many clothes in my closet with them, I currently take up 3 bars of clothes, my husband, 1, and even on his 1, I have half of that too, so I guess 3.5 is mine, luckily he doesn't care, phew! Love the outfit, makes me want to go out and buy that outfit. 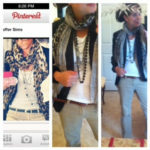 I like the outfit with the light khaki-colored cardigan! I desperately need a leopard print item in my wardrobe–whether it be shoes or a scarf. I love seeing closets. Yours is so colorful–and look at all those shoes! 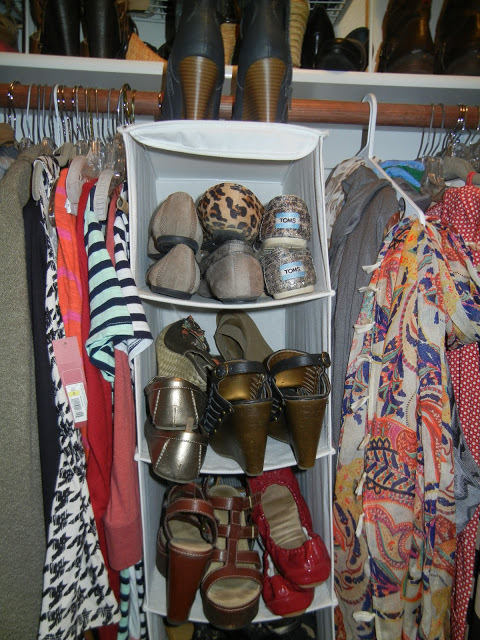 I'm trying to make better use of my closet too, thanks for those ideas and links! And I think I need gray cords in my life! We need a field trip to Loft together so you can show me all the good stuffs! Just found you on Our Fifth House. LOVE IT!!! 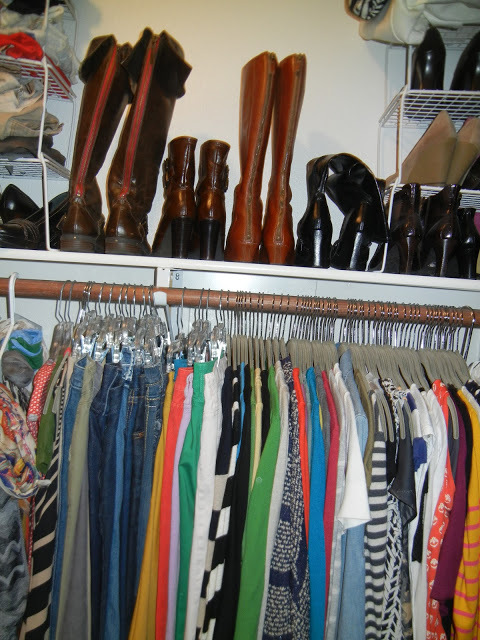 Your closet reminds me of mine, and I totally go to pinterest to help pick outfits from what I already have. Wow…I feel so…enlightened! I have never seen a scarf hanger before, but now, not only do I want one…I know for sure that I NEED one! If I may ask…I feel like Sean's face tells you how he's feeling (whether he's aware of it or not)…I feel like I could tell that Kacie B won't be getting out of the 'friend zone'–even though he's open to the idea…and I could tell he really connected with Desiree (I bet she'll be around for a while)…do you see this or is it all in my head? 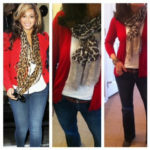 Love that leopard scarf! 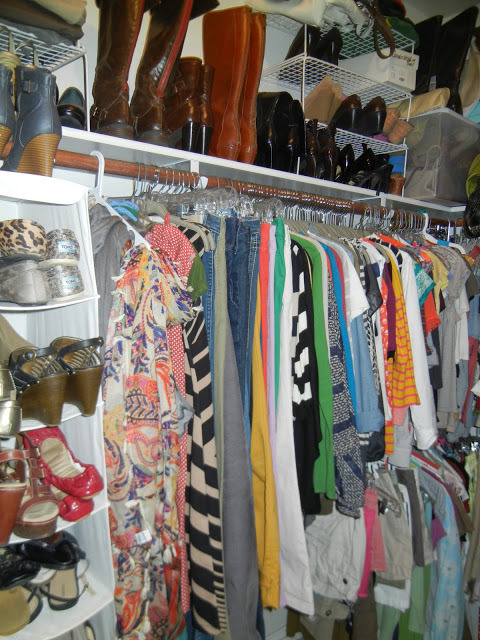 And I totally need to organize my closet…this is motivation! Love the outfit and I can see how a light cardigan would make a big difference. 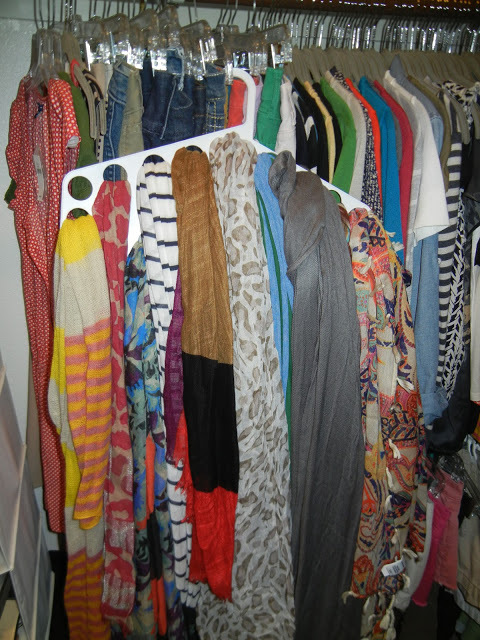 I need that scarf hanger..thanks for sharing!